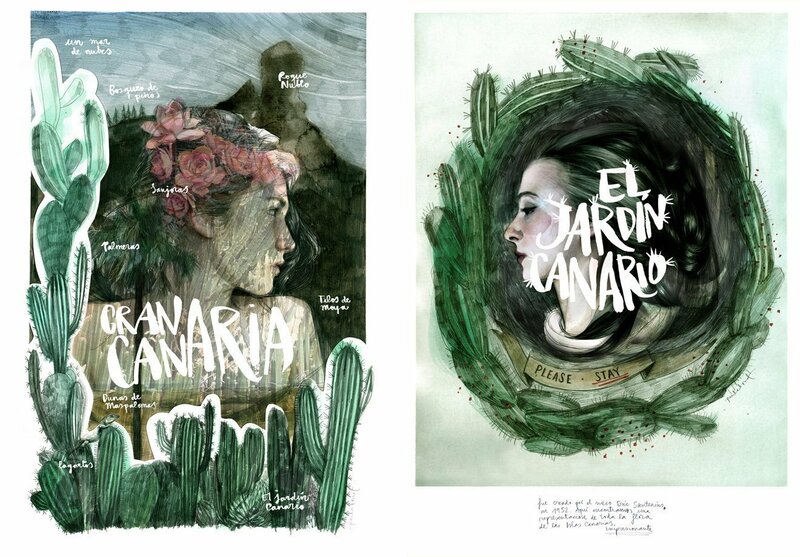 Seven European illustrators (Ekaterina Koroleva, Malika Favre, Paula Bonet, Ben Heine, Jens Magnusson, Steve Simpson and Mads Berg) traveled to each of the seven Canary Islands to discover, feel and draw the experience in travel notebooks and original illustrations to share through social networks and other channels. The public has been able to follow the steps and the creative evolution of the artists in an online travel notebook that has been published on the project’s website in real time (onthedraw.travel) as well as on social networks under the hashtag #onthedraw. It achieved more than 54,000 “likes” on Facebook, 90,000 on Instagram and an audience of almost 1,000,000 on Twitter. 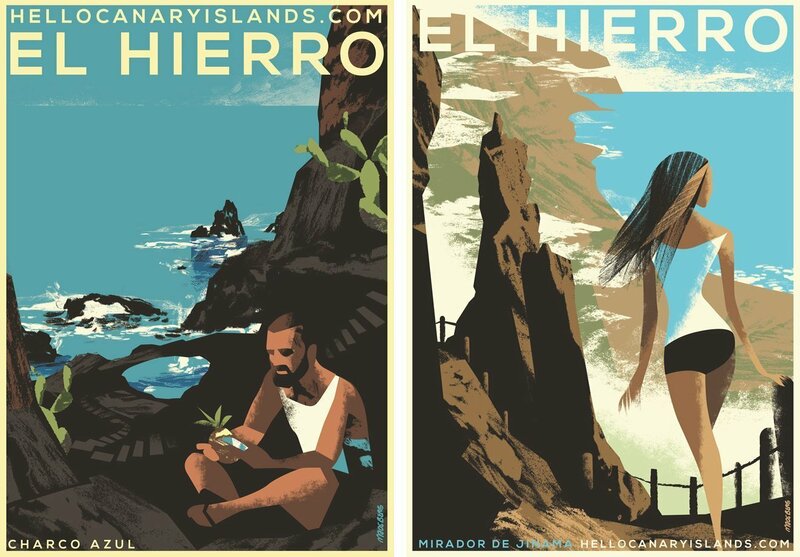 In the following years the illustrations that were created for this campaign have been featured at multiple tourism expos at which Canary Islands was present. We often hear or read how writers, poets and musicians were spending their months-long vacations here or there. This creates the feeling that a certain place is authentic, great for inspiration or for getting over a writer’s block, etc. So I really like the idea of associating art with a destination, which is a very long-term investment. The main Canarian islands (from largest to smallest) are: Tenerife, Fuerteventura, Gran Canaria, Lanzarote, La Palma, La Gomera and El Hierro. 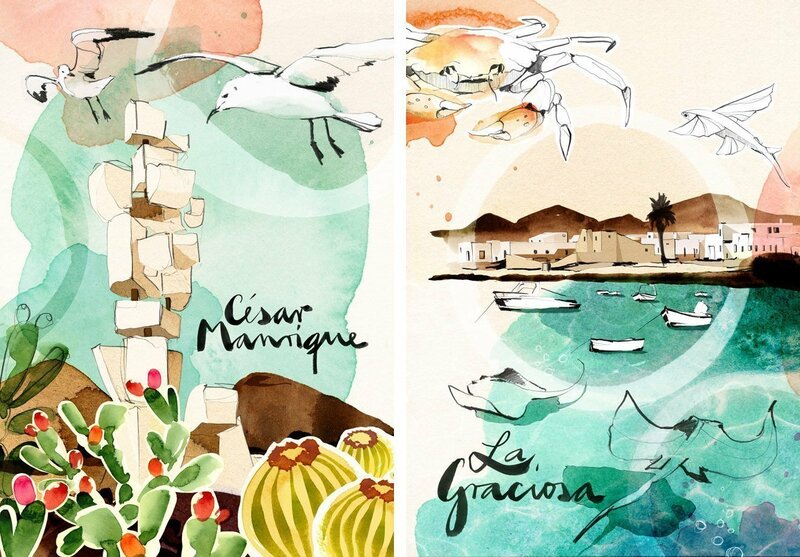 Each illustrator was paired up with a local artist that served as a host and travel partner. 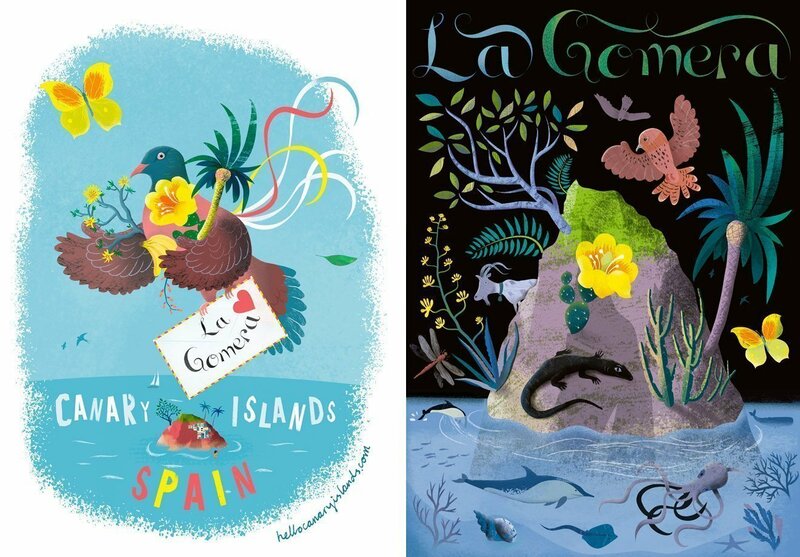 The Canarian hosts accompanied illustrators at every turn in their journey across the islands working as guides, counselors and eventually, good friends. 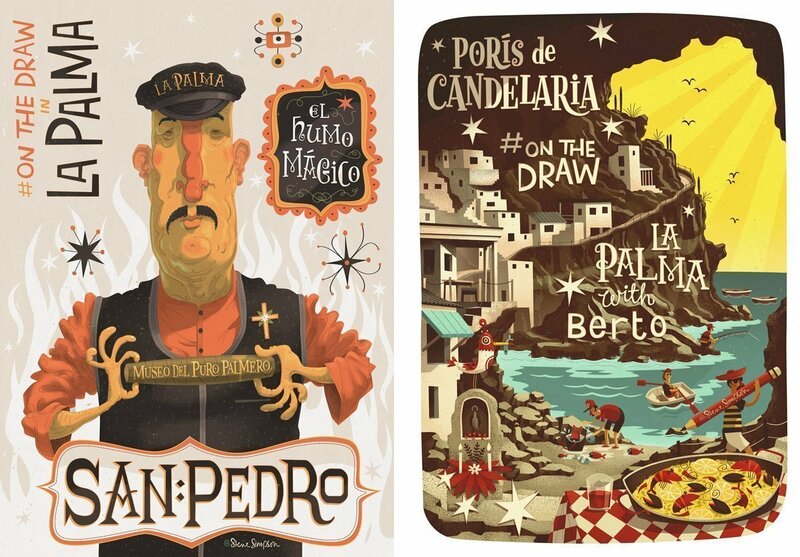 #OnTheDraw Illustrators and Their Contributions – What’s Your Favourite? 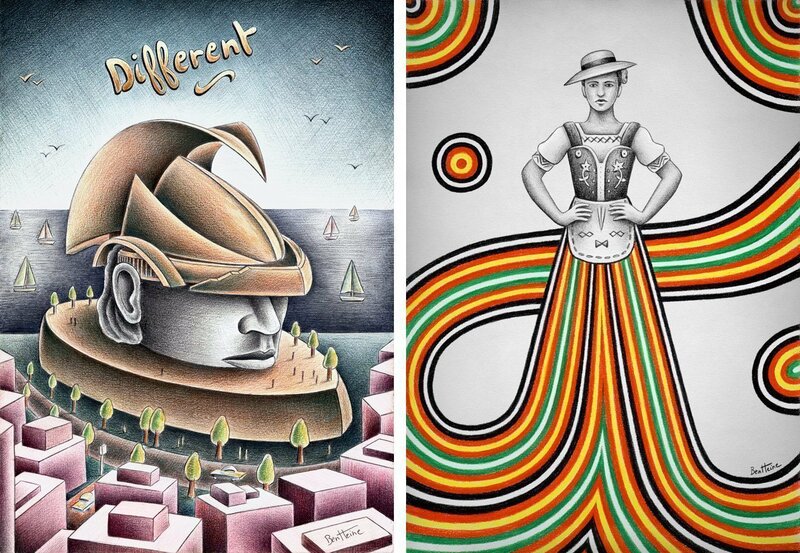 Multiple illustrations were created by the seven amazing artists that were invited for this event. Below are some of my favourites from each artist. Nature and color in the ‘Island of Volcanoes’. Varied colored lava, a courageous flora that does not renounce color and a big flash produced as the sea meets the sky on the horizon. Geometry, plain colours, accented volumes and shadows, movement and stillness, happy solitude. 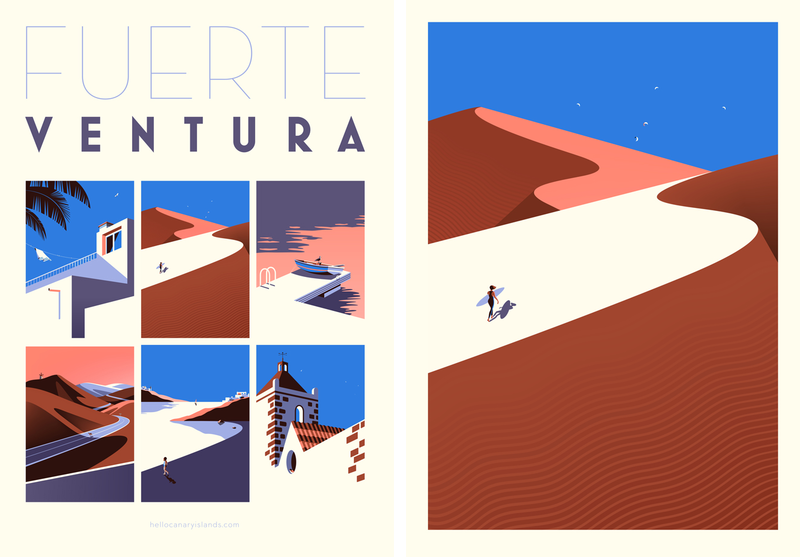 Fuerteventura is a land of fire, desert and sea, an interior landscape where individuals seem to be searching themselves. Experience and landscape, nature and people, sensations that invade the physical territory demarcating it, digesting until making it part of ourselves, adding it to our own personality until it melts into a whole. The landscape in human scale, man as measure of all that surrounds him, an animated environment where fantasy and leyend turn into reality, take shape and their borders are blurred. A coloristic and happy vision of La Gomera in which man is just another element that lives in perfect symbiosis with the natural environment. A tale in which sky and earth boil with life as they play the eternal game of survival. The #onthedraw project is the best assignment I ever had. It was the beginning of a big step up for me, with more inspirational and international assignments. I got a whole new kind of images added to my portfolio. It was also very inspirational to meet the other hot shot illustrators and be taken very so seriously and respectfully by the staff. It opened my eyes for the Canary Islands, that I had previously had some prejudice against, like too touristic. I now feel like an advocate for the islands and I’m telling all my friends and colleagues about it. Especially La Gomera and Tenerife. I’m dreaming of the wonderful Jardín Tecina Hotel where I was staying at La Gomera and the food, beaches and the nature. And of course the scenery and the nice people. I’m utterly thankful for the chance of having participated in #onthedraw! Moments associated to sensations drawn with surgical accuracy and an educational spirit combined with big doses of humour. This makes us part of every little thing that shapes that thing we call life. It makes it worth the risk of living it. The limited dimensions of El Hierro (278 km/2) and its nature, disposessed of all that is not essential makes you aware of our finite condition and the world we are living in. It makes us watch from outside to the inside, to our deepest being. I think this was a fantastic idea with a long-term objective. It was not about generating X amount of likes or of video views. Those things can look great in a campaign report, but this one generated tangible results in the form of genuine art. Great job Canary Islands, great job!